The Spirit gives us eternal life, the life that is Christ Himself (2 Cor. 3:6; 1 Cor. 15:45). First Corinthians 2:8 says that Jesus Christ, who was crucified, is “the Lord of glory.” He first revealed this glory on the mountain near Caesarea Philippi and will ultimately be glorious in New Jerusalem. Colossians 3:4 declares, “When Christ our life is manifested, then you also will be manifested with Him in glory.” This is a promise. Colossians 3:1-3 show us how to reach this climax. First, in 3:1 we “seek the things which are above, where Christ is, sitting at the right hand of God.” These things “above” are the unseen, eternal things in Second Corinthians 4. We also set our mind on these things (3:2), including “the Jerusalem above” in Galatians 4:26. In contrast, we do not set our mind “on the things which are on the earth” (3:2). This is parallel to Romans 8:6, “the mind set on the flesh is death, but the mind set on the spirit is life and peace.” Flesh corresponds with things on the earth and spirit corresponds with things above. How do we carry this out? Colossians 3:3 reminds us, “you died, and your life is hidden with Christ in God.” Our death with Christ and Christ as our life are facts. The experience of these facts is in spirit*. 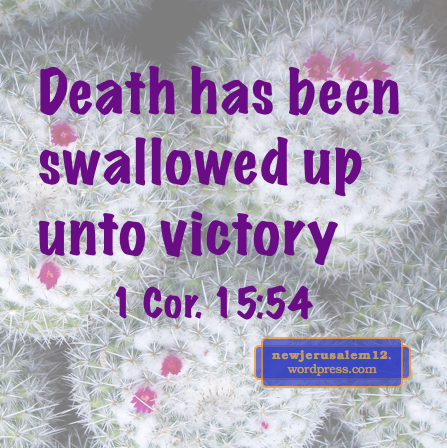 Our death with Christ saves us from earthly things. 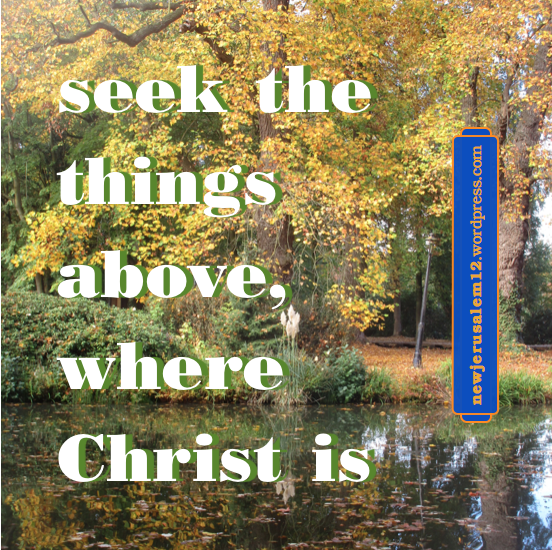 Christ as our life supplies us to seek the eternal things above. Living in the spirit is the path to being manifested with Christ in glory and being prepared for New Jerusalem. Lord, grant me more living in spirit to experience You more. * See Key to Experiencing Christ–the Human Spirit, The. “If anyone is in Christ, he is a new creation” (2 Cor. 5:17). That is an accomplished fact based on our faith in Jesus Christ. Now, through the renewing of the Holy Spirit, we are gradually becoming the reality of New Jerusalem. 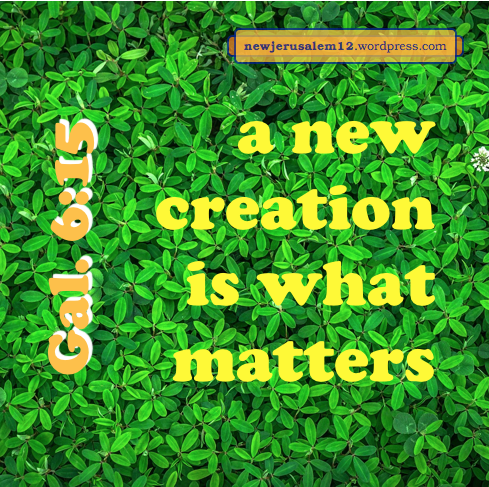 Paul the apostle, writing about his Christian living, said, “a new creation is what matters” (Gal. 6:15). 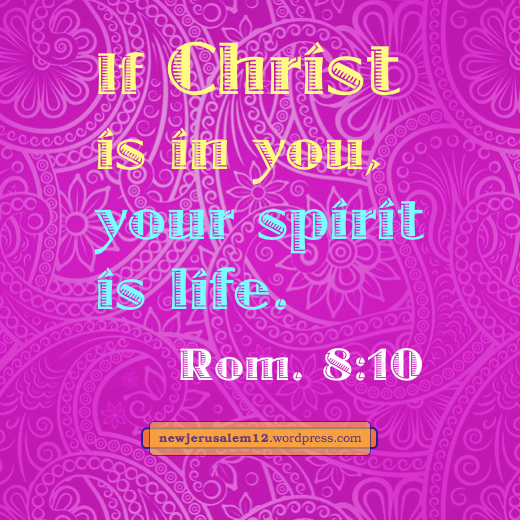 Today our spirit is life and the Spirit in our spirit is life to our whole being (Rom. 8:2-11). And our new heart loves the Lord and His word. This is our experience of the new creation and our foretaste of New Jerusalem. * Part of Galatians 6:15, note 1, written by Witness Lee, in the online Recovery Version NT. The breaking portrays the death of Christ and the partaking implies His resurrection. By His death and resurrection, we have all become one in Him. 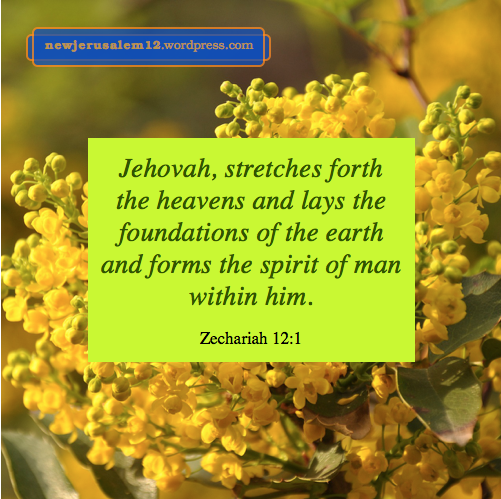 This is the oneness of His Body, of the one new man, and of New Jerusalem. Partaking of the bread makes us one. This is not the physical bread on the table, which is only a symbol. Remember John 6:63, “It is the Spirit who gives life; the flesh profits nothing.” Jesus Christ is the real bread, the living bread, as testified in all of John 6. 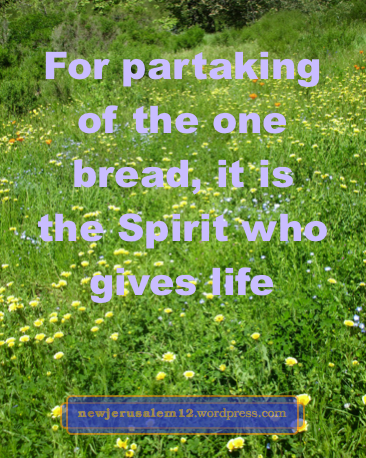 Today our eating/partaking must be by exercising our spirit to contact the Spirit. Receiving the word in spirit energizes us to participate in the one Body as the foretaste of New Jerusalem. Both the tabernacle and the temple are pictures of the church as the New Testament dwelling of God and of New Jerusalem as the eternal dwelling of God. In Old Testament times, God had a dwelling among His people. Yet even then He was longing for a dwelling in His people. This indwelling is realized now in the church as the precursor of New Jerusalem. Christ is in us and the Spirit is dwelling in us (Rom. 8:9-11). Thus, we are the reality of what was symbolized by the Old Testament temple (1 Cor. 3:16-17) and we are experiencing a foretaste of New Jerusalem. This spiritual building will progress on to New Jerusalem. 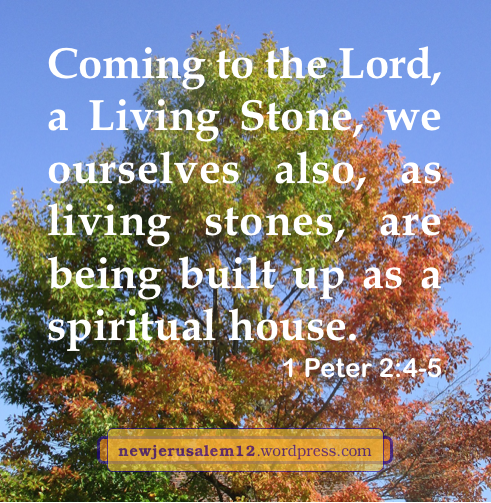 New Jerusalem will be a spiritual city with Christ as the Living Stone and all of us a living stones and with the Spirit dwelling in each one of us. * Acts 7:49, footnote 1, in The Holy Bible, Recovery Version, published and © by Living Stream Ministry, Anaheim CA, 2003. _____He flows throughout the ages. ___The river to convey the tree, Himself as life deliver. Although man sinned and was separated from God’s life, God came in Jesus to redeem and to impart His life. ___God flowed Himself into a man, The man we call Christ Jesus. ___He gave up His own life for man And God’s own life releases. In John 10:10-11 He told us that in death He laid down His soul life for us that we may have eternal life abundantly. ___But out came blood and water! ___The blood and water flowed from Him, In streams of pure salvation. ___The blood brings cleansing from all sin; Water, regeneration. In resurrection the Spirit flowed, as promised in John 7:37-39. ___And now the Spirit flows, Brings God where’er He goes. 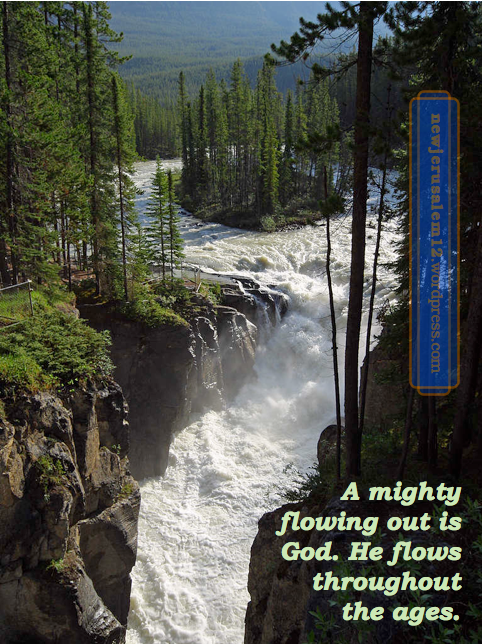 This flow enlivens all who receive and builds us together in the Body of Christ. Ultimately, in New Jerusalem is the river of water of life and the tree of life (Rev. 22:1-2). ___And God flows on forever. New Jerusalem is the consummation of the Bible. It is the high point of everything God has done through the ages, especially what the Spirit has wrought within redeemed humanity. This is why we need to be in spirit and on a high mountain to see New Jerusalem. New Jerusalem is God’s eternal goal. It is also the eternal goal of every one of God’s people. Would you like to know where you are going? In spirit and on a high mountain, we can see the goal. The present sufferings seem large when we focus on them. But we should look at the coming glory of New Jerusalem and rejoice! We have a Christian journey to a spiritual mountain to see New Jerusalem. To reach this mountain requires experiences of Christ. It also requires exercise of our spirit mingled with the Spirit because a proper Christian life is a walk according to the spirit (Gal. 5:16). In Matthew 4:17 the Lord proclaimed “Repent, for the kingdom of the heavens has drawn near.” In Matthew 5–7 He spoke about the reality of life in this kingdom. Both are necessary steps toward the vision of New Jerusalem. Repentance was proclaimed to those beside or on the sea of Galilee, which typifies living in a worldly situation. May we all repent of whatever degree of worldliness we have. Then we go up a mountain (Matt. 5:1) to enter the reality of the kingdom of the heavens. In ourselves we cannot fulfill what the Lord spoke in Matthew 5–7. But He gave us the key, “our Father.” He spoke this phrase at least 12 times in these three chapters. 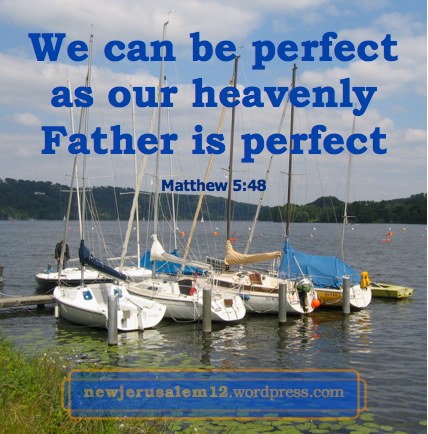 We are sons of our Father (5:45) and His life in us enables us to “be perfect as your heavenly Father is perfect” (5:48). Beside the sea we repent and on the mountain we live by the Father’s life. The reality of this life is the Spirit. “The Spirit gives life” (John 6:63, 2 Cor. 3:6) and because of being born again our spirit is life (Rom. 8:10). 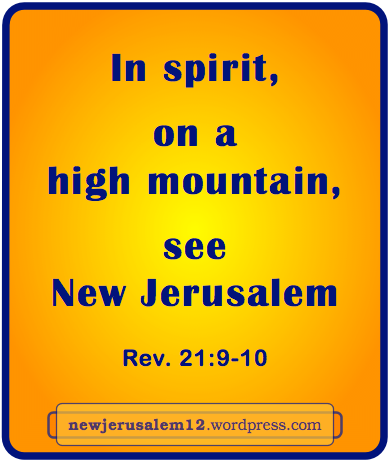 It is in our spirit, regenerated by the Spirit, that we are carried to the mountain for the vision of New Jerusalem.